MAA School of Hotel Management is dedicated to help you quickly to gain the education and skills you need to succeed in your culinary career. 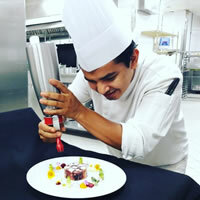 In just few months, you could earn a diploma along with your work and be ready to put your skills to work in the kitchen as a professional working chef. The Culinary Arts Management Program is built around a focused, hands-on, practical curriculum that systematically takes students through the essentials of a working kitchen. There's no fluff here: the subjects and skills taught by our mentors are what restaurant owners and executive chefs want from their new staff members. Our aim is to help our students to become more professional in their area of operations by giving them a solid grounding in the basics and many hours of hands-on work practice. There is no better way to learn the craft and art than to practice it daily to perfection. Individual classroom education is limited and rotated with apprenticeship at Restaurants, Pizza Huts, Clubs and Resort Hotels. You will study individually with assigned tutor/mentor in your chosen field while you are at work. Total academic hours of study on training the basic concepts in culinary arts will depend on the student’s requirement. Student assessment and evaluation will be done by assigned tutor/mentor by way of conducting tasks, assignments and project work. Study hours are not compulsory for skilled workers and if industry demands them on work spot. But total study will be given by your mentor at your convenient time intervals as well as the convenient time of mentor. But finally your mentor should certify that you have undergone theoretical training in related to your work experience and apply the knowledge to your work. The students are advised to do project work as part of the curriculum based on their experiences in academic and industrial work experience. This project will enhance the individual’s creative aspect in culinary arts. This project report should be precise and should not be more than 25 pages and should be submitted in pdf file to the mentor assigned to him. The project topic should be related to the student specialization and should be presented in professional way. The curriculum is designed to teach the basic skills and knowledge of culinary food preparation in International cuisines through theory and applying it in practically during work and enriches the student with high knowledge of technical art in food production. 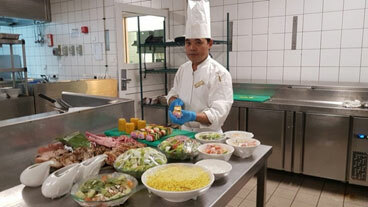 Good English speaking Food production staff with in-born passion for cooking, systematic and steady-minded, and who enjoys in meeting various guests and provide them tasty and healthy food. Minimum two years work experience in food production outlets is highly essential.